Warren Buffett is considered one of the most successful investors of our time. According to BusinessInsider‘s Andy Kiersz, in “Here’s How Rich You’d Be if You’d Invested $1,000 in Buffett Way Back When”, $1,000 invested in Berkshire Hathaway in 1964, would be worth about $11.6 million today. This information uses the 1964 share price of $19 and the February 27, 2015 closing price of $221,180 for Buffett’s Berkshire Hathaway (BRK-A). With the more recent closing share price of $194,620 (September 25, 2015) you’d still be rich. Bonus; What is Multifactor Investing and is it Worth a Try? I don’t know about you, but this type of information doesn’t particularly cheer me up. The ‘woulda, coulda, shouldas aren’t particularly helpful. Instead of looking backwards, let’s move ahead with these inspirational Warren Buffett investing quotes. Use these inspiring Warren Buffett Investing quotes to educate and motivate you to investing greatness. This is a great rule, but as any seasoned investor knows, if you invest in the financial markets you occasionally lose money. In fact, even Warren Buffett has lost money a time or two. The best way to avoid losing money on an investment is to do your homework, research the stock or fund and buy at the right price. 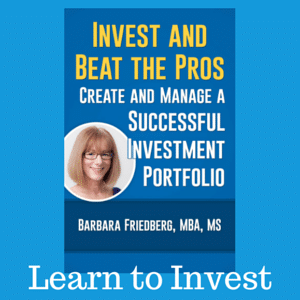 Investing in individual stocks is time consuming and requires a tremendous amount of research. That’s why I don’t invest in individual stocks anymore. But even if you stick to mutual funds, you may overpay. Stocks and stock funds have a price tag(s) which are calculated with valuation ratios. If you pay too much, even the best stock bought at the wrong price will take your money. Phrased another way, ‘hindsight is 20-20’. If anyone says they know what’s going to happen in the future, run the other direction. The best way to invest is by being lazy and average. In any given year no more than approximately 25-35% of active managers beat the market indexes. And the catch is that even if someone beats the markets one year, it’s unlikely they’ll outperform the next. This means, active trading is a losers game. Investor’s who buy and sell are more likely to lag the market than to beat it. Look at the research! 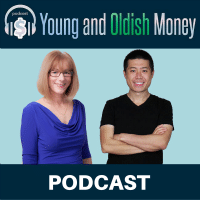 On a John Bogle video I watched awhile ago, the founder of the modern day index fund and Vanguard Investments suggested (tongue-in-cheek) that you should invest throughout your life and only check the stocks, bonds, and funds prices when it’s time to retire. Although checking mutual fund prices once, at retirement, is not enough checking prices every week is too often. Once per year or quarter, will help you sleep better. 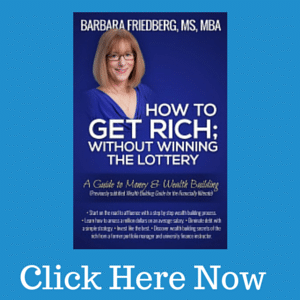 “What I advise here is essentially identical to certain instructions I’ve laid out in my will. One bequest provides that cash will be delivered to a trustee for my wife’s benefit. . . . My advice to the trustee could not be more simple: Put 10% of the cash in short-term government bonds and 90% in a very low-cost S&P 500 index fund. (I suggest Vanguard’s.) I believe the trust’s long-term results from this policy will be superior to those attained by most investors . .” ~ CFA Institute.org; Enterprising Investor in “Warren Buffett’s 90-10 Rule of Thumb for Retirement Investing” on March 4, 2014. Last year on a CNBC Squak Box interview, he hit it out of the park with this inspiring Warren Buffett investing quote. In that quote, Buffett disclosed plans for how to invest his estate. Guess what, it’s in index funds. If the greatest investor of this generation recommends a passive investing approach, maybe you should listen! These 5 Inspiring Warren Buffett Investing Quotes and their interpretation can serve as a ‘cheat sheet’ for index fund investing practice and success. 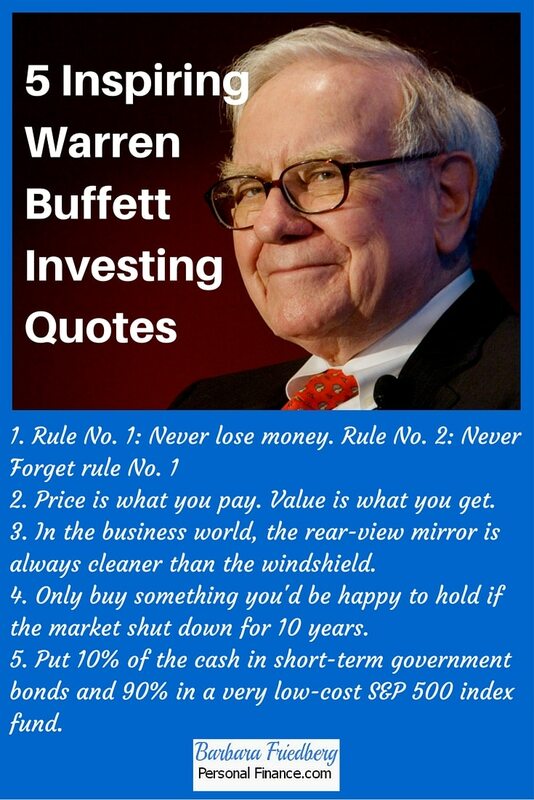 Source; Quotes 1-4 – Ruleoneinvesting.com, “29 Warren Buffett Quotes on Investing and Success”. A version of this post was previously published. Very inspiring indeed. Thanks for sharing these quotes! That’s the best one in my opinion. I see so many analysts come on after the fact and say well of course this happened because of this and that. But they were nowhere to be found before it happened. Warren Buffet is an icon in investing and everyone’s inspiration and mentor. What I love about this guy, is that he knows when to quit and not to quit. He has this innate skills about investing that everybody loves to acquire. @MWM – I suggest combining your own research with analysts views to make your investment decisions. @Hashtag – And he seems like a guy with strong values and character, as well as being an exceptional investor! Thanks for sharing these great quotes, I think those are probably his more well known ones, especially the one about investing in the S&P 500! I love Warren Buffett, I went to the Berkshire Hathaway AGM last year and it was very memorable. GYM, All investors, and veteran can learn from Buffett’s wisdom. How exciting to attend the annual meeting. Are you a shareholder?